ON THE FIRST DAY OF OUR ANNUAL SUMMER GATHERING at the little Forest Service cabin on the North Fork Road, after we’ve set up our chairs around the fire circle and filled our red cups, inevitably someone will look east toward Glacier National Park, point at two spindly, dying conifers between us and the mountains and say, “Those two trees are totally blocking our view.” It’s a time-honored ritual, only slightly less important than picking up pastries at the Polebridge Mercantile on our way up here. I always think of it as the reality check that we city folk from Helena need as we acknowledge how lucky we are to be in this little piece of heaven with no plumbing, no electricity, no screens, and just the one little thing to mar our view from the Wurtz cabin at the end of the road. For four years now, we’ve been loading vehicles with coolers, kids, beverages of a wide variety, kayaks, rafts, swimming gear and games, and heading north from Helena to Columbia Falls and then further north into the no-cell-zone that is Polebridge and the western edge of Glacier National Park. The cabin that we’ve claimed as our own for a few days at the end of July for the last few years is the Wurtz homestead, 7 miles up the gravel road from Polebridge, not quite to the Canadian border. It comes with a storied — and sad — history. When you’re at the cabin, you can read about Frank and Ella Wurtz’s 1914 journey by covered wagon to this remote spot. It’s impossible not to be grateful for the SUV that just carried you here in relative comfort, and equally impossible not to appreciate the incredible effort that they made carving a life out of the wilderness. The National Register of Historic Places sign on the outer wall of the back porch tells the story of how the Wurtz family cleared the land, built the first and second cabin, and then about the fire that was possibly a cover-up for the kidnapping of the two youngest children. The cabin that’s here now was built during the period of heartbreak following their loss. The family eventually left the homestead, then returned to thrive here until the 1960s. In 1990, it was transferred to the Forest Service; the pictures on the walls inside reveal the hard work that agency spent restoring the cabin and converting it to rental use. 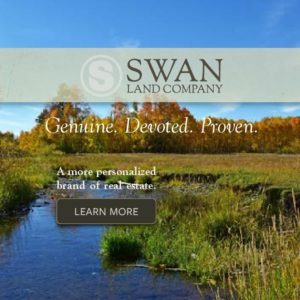 Now it sleeps 18, or so the website says. We’ve mostly been three or four families of four, kids in the sleeping loft, adults in the bedrooms. We aren’t busy clearing the land and trying to eke out a living. Our agenda revolves around games on the big dining room table, magazines and books in the living area, and lots and lots of bacon in the kitchen. 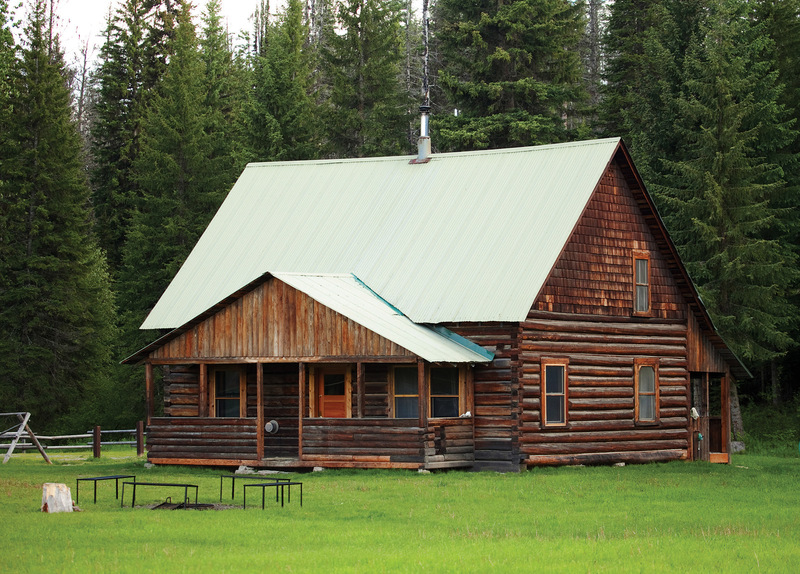 One of the most popular Forest Service rentals in Montana, the cabin boasts a kitchen with a dry sink and a four-burner Wolf range with griddle and oven, and propane lights throughout. For the five or so days that we are up here, we will eat and drink very well. The children will be unplugged from gadgets and emerge, filthy, from mud-pie making in the creek (even the middle-schoolers). And we will indulge our need for this landscape and each other’s friendship, while testing it over endeavors like launching the raft on the North Fork of the Flathead River at the Canadian border, and killer games of Settlers of Catan. The North Fork is one of those places that you have to want to get to in order to get to it. The scenery, as you look toward the knife-edged and snowy peaks of the Park, is enough to inspire religious fervor. The river offers hours of serenity and poses enough challenges to keep the kids interested in more than the snack cooler. The traffic on the dirt outer North Fork Road is light. Drive just 14 miles north of Polebridge, with its signature mercantile offering ice, baked goods and sundries, and you’re at the old border crossing to Canada. 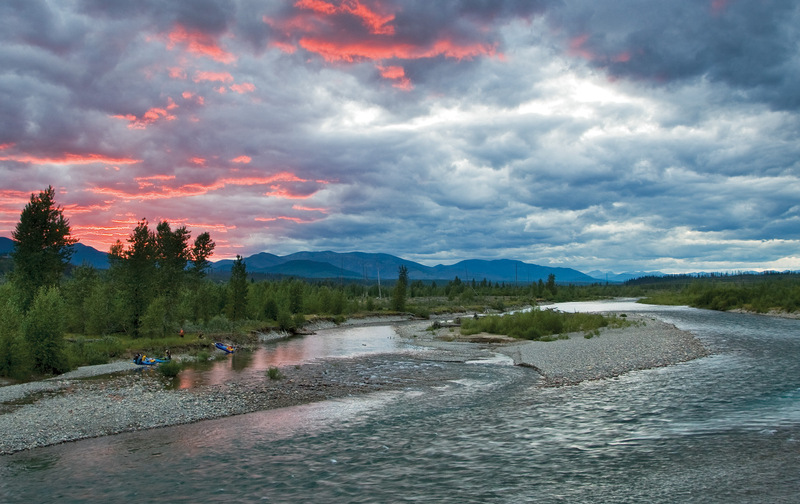 You can turn east at Polebridge to drive into Glacier and visit Bowman and Kintla lakes — perfect for picnicking, camping and nonmotorized boating. While you can’t make a cellphone call or answer email, AAA will still come if you call from the pay phone hanging on the Merc’s front porch. Polebridge itself is just as picturesque as you might imagine from photographs of the two-story, false front, red-painted mercantile. The rumors about the huckleberry bear claws and snickerdoodles are true. 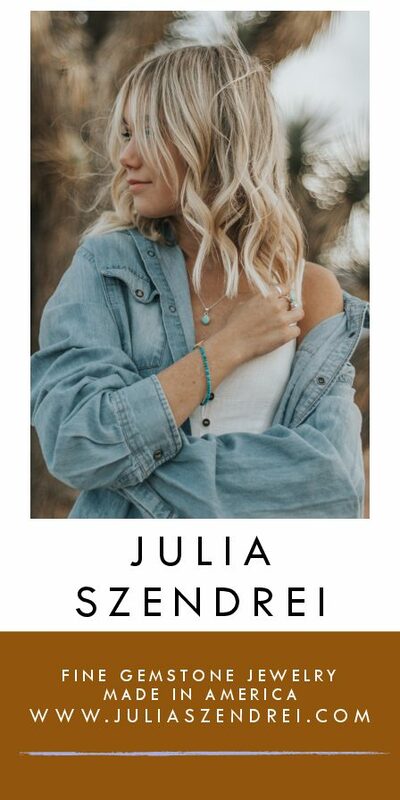 This is one of the best bakeries in Montana, and the lines that stretch to the back of the store aren’t just there because it’s the one place to buy ice and souvenir T-shirts up here. The center of this small town, which has a hostel, river take-out, a few cabins, a little lending library, and the Northern Lights Saloon, the Mercantile’s historic country store never feels like it’s trying to achieve quaintness. It just is what it is. Local artists sell pottery and jewelry. Ads for cars “big enough to sleep in” pop up on the message board outside, and the inevitable dogs wander in and out. If you live in Polebridge, you know everyone who lives there or up the Fork. If you don’t, you may still run into a waiter at the Northern Lights who you met over the winter in Mexico. The Northern Lights offers killer gin and tonics and anything else you might want: beer, wine, pizza (on Fridays only) and some of the best bison, elk and beef burgers you’ll ever eat, (especially if you choose to eat them on one of the Merc’s cheddar-jalapeño buns and have seasoned your appetite with an all-day float). There are a few tables inside and under the porch roof for when it’s raining, and picnic tables in the yard outside, overlooking the sand volleyball pit and play area, for when it’s not. Drinks are served in mason jars, and the server who comes to your table can tell you all about the potato salad (yum!) because his wife makes it. This is the traffic hub of the North Fork, and if you sit long enough enjoying your food and beverage, any friends you’ve lost track of during the day will probably turn up in the course of running shuttles for floaters who are coming off the river before dark. Polebridge is a summer town — it survives because of its proximity to Glacier, of course, but it seems to thrive because it’s on the periphery. In spite of the transience of the tourist and outdoor crowd that it attracts, this is a community. And even though it draws relatively large crowds for such an out-of-the-way place, being there still feels like you’ve been let in on one of the great secrets of the universe: that you’re part of a private, but not at all exclusive, club. The Wurtz homestead, one of several Forest Service rental cabins north of Polebridge. Spectacular colors highlight the clouds over the river channel on the North Fork. 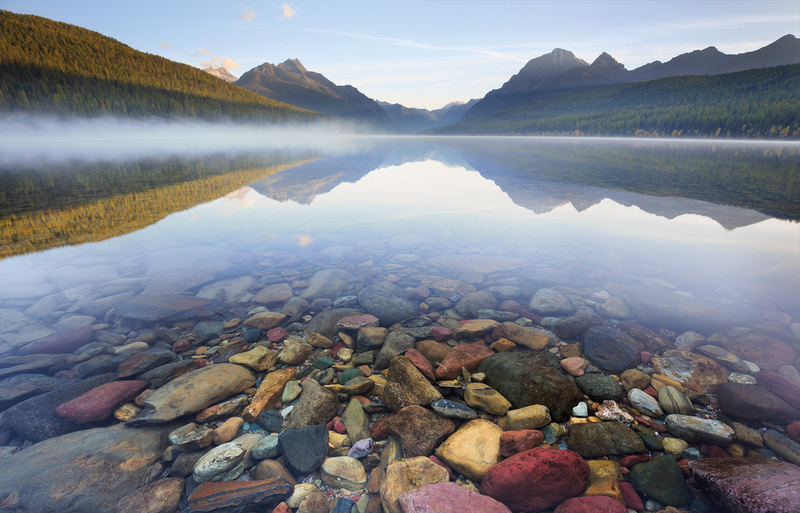 The river rocks in Bowman Lake form an underwater mosaic in the early morning light. 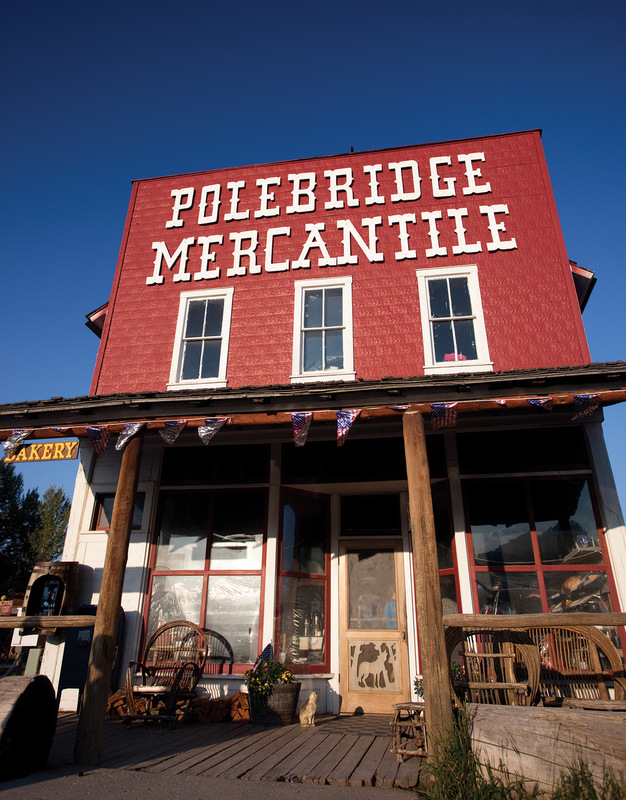 The iconic red front of the Polebridge Mercantile, the heart of town. 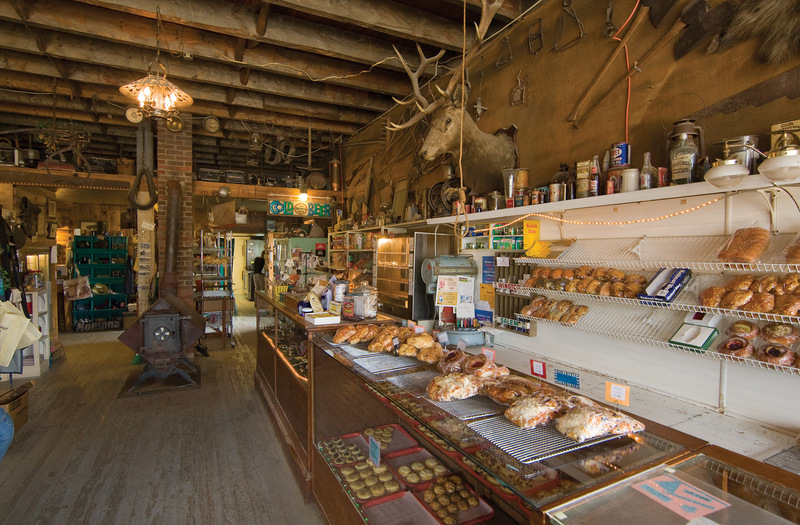 Huckleberry bear claws, apple turnovers, and a wide variety of cookies line the racks inside the Mercantile.